10 Tips for Selecting Toys for Your Speech Delayed Child - Advice in selecting toys for a child with speech/language delays. A Practical Guide to Preventing Occupational Hearing Loss (1996) - Intended to assist employers and employees to develop and maintain hearing loss prevention programs that work, and are not just perfunctory measures. Acoustics Society of America Publications - Serves physical scientists, engineers, psychologists, physiologists, architects, musicians, and speech communication specialists who wish to report the results of their research in acoustics. ADVANCE Online - A weekly publication, reporting on up-to-the-minute developments, the latest technology, and current trends in audiology and speech-language pathology. Aearo: Hearing Protection Tech Support - As one of the world's leading developers, manufacturers, and marketers of hearing protection products, Aearo Company supplies extensive technical support in the subject of hearing conservation and hearing protection. American Industrial Hygiene Association (AIHA) - Query AIHA for "hearing" and you'll get articles relating to hearing loss, conservation, exposure, workplace issues, regulations, etc. American Journal of Speech-Language Pathology (AJSLP) - Articles concern screening, assessment, and treatment techniques; prevention; professional issues; supervision; and administration; and may appear in the form of clinical forums, clinical reviews, letters to the editor, or research reports that emphasize clinical practice. Auricle Ink Publishers - Editor and Clinical Audiologist Richard Carmen brings together distinguished audiologists, scientists and experts in the field. A leading resource for those suffering from hearing loss. Bibliography on Hearing Protection, Hearing Conservation, and Aural Care, Hygiene and Physiology 1831-2001 - Prepared by E.H. Berger, MS. Comparison of U.S. Hearing Conservation Regulations and Recommendations - Comparison of the hearing conservation requirements of U.S. general industry (OSHA, 1983), mining (MSHA, 1999), and recommendations of NIOSH (1998). Hearing Conservation - Brief PowerPoint presentation of types of hearing loss, estimating sound levels, and types of hearing protection. Hearing Journal - In addition to monthly magazine, also visit Hearing Journal Directory, Industry Events and Resources pages. Hearing Protection Article Catalog - Bibliography. How's Your Hearing - The American Academy of Audiology (AAA) has a consumer Web site that featuring overviews of topics including hearing, hearing loss prevention, hearing aids, cochlear implants, common conditions, and more. It also features access to a Find an Audiologist directory and the latest consumer-friendly articles from Audiology Today. Also see the AAA's Just For Kids and Young Adults resources. Journal of the American Academy of Audiology (JAA) - The JAAA publishes articles and clinical reports in all areas of audiology, including audiological assessment, amplification, aural habilitation and rehabilitation, auditory electrophysiology, vestibular assessment, and hearing science. Journal of Speech, Language, and Hearing Research (JSLHR) - Articles concern reports of original research, including single-study experiments; theoretical, tutorial, or review pieces; research notes; and letters to the editor. Language, Speech, and Hearing Services in Schools (LSHSS) - LSHSS publishes studies and articles that pertain to speech, language, and hearing disorders and differences in children and adolescents, as well as to professional issues affecting service delivery in educational settings. Medical-Legal Evaluation of Hearing Loss, 2nd Edition by Robert A. Dobie, M.D., F.A.C.S. - Covers all aspects of hearing loss claims and court cases for physicians, attorneys, employers and insurance professionals. The second edition has over 150 new references and new discussions on topics such as: otoacoustic emissions, genetics of hearing loss, developments in hearing protection, effects of race and scioeconomic status on hearing, susceptibility to noise-induced hearing loss, acoustic trauma from airbags and audiological testing, and fetal noise exposure. Practical guidance is provided for medical witnesses on hearing loss evaluation, diagnosis, allocation and reporting. Legal practitioners are briefed on how to accurately interpret medical-legal information for their work with expert testimony. MEDLINEplus: Hearing Disorders and Deafness - Extensive resources. Musician's Clinic of Canada: Articles - Music -related hearing loss articles. National Hearing Conservation Association (NHCA) Publications - Presents resent recent articles and other materials relating to hearing loss prevention. Online Directory of Audiology and Speech-Language Pathology Programs - Information about thousands of programs that employ audiologists and speech-language pathologists who hold the Certificate of Clinical Competence (CCC) from the American Speech-Language-Hearing Association (ASHA). Patient's Guide to Tinnitus - By Robert L. Folmer, M.D. Rights for Those with Hearing Loss - Excellent overview and resources concerning the Americans with Disabilities Act (ADA). The the ADA sets forth guidelines and regulations outlining the accommodations and rights afforded to the deaf and hard of hearing in order to provide equal access and opportunity to the deaf, hard of hearing, and other disabled individuals. Speech Therapy Apps and Technologies Ordered by Disorder - A resource guide featuring a collection of speech therapy apps and other technologies organized by the disorders for which they're most useful. Many of these apps can be used by children to complement the therapy they're receiving from their speech-language pathologist while others can be used by SLPs, parents, and teachers to help guide children with speech disorders through their therapies. Tinnitus Treatment - By Robert Sweetow, Ph.D.
Update - The newsletter of the Council for Accreditation in Occupational Hearing Conservation (CAOHC). Acoustic Neuroma Association (ANA) - Provides information and support to patients who have been diagnosed with or experienced an acoustic neuroma or other benign problem affecting the cranial nerves. Acoustical Society of America (ASA) - Serves the widespread interests of its members and the acoustics community in all branches of acoustics, both theoretical and applied. American Academy of Audiology - A professional organization dedicated to providing quality hearing care to the public. American Academy of Otolaryngology - Head & Neck Surgery - Source for informatin on the ears, nose, throat and related structures of head and neck surgery. American College of Occupational and Environmental Medicine - Represents more than 6,000 physicians specializing in the field of occupational and environmental medicine (OEM). American Speech-Language Hearing Association (ASHA) - The professional and scientific association for more than 96,000 speech-language pathologists, audiologists, and speech, language, and hearing scientists in the U.S. and internationally. ASHA's journals provide both clinical and research data on speech-language pathology and audiology. American Tinnitus Association - Organization dedicated to promoting the relief, prevention, and the eventual cure of tinnitus. Publishes Tinnitus Today. Associates in Acoustics, Inc. - A professional consulting firm specializing in industrial noise measurement, engineering noise control, and hearing conservation programs. Association for Research in Otolaryngology (ARO) - An international association of scientists and physicians dedicated to scientific exploration among all of the disciplines in the field of otolaryngology. Research efforts involve the ear, nose, head, neck and related functions including hearing, balance, speech, taste and smell among others. Audiology Awareness Campaign - Organized by five professional audiology organizations to help persons with hearing loss. AUDITORY List - Provides information about and related to the AUDITORY List, an email list for the discussion of organizational aspects of auditory perception. AudiologyNet - Audiology and hearing healthcare informational web site. Center for Hearing and Communication - Offers hearing testing, hearing aid fitting, speech therapy and full range of services for people of all ages with hearing loss. Center for Hearing Health - Serves businesses that have a workplace environment where the noise level is potentially harmful to the employees. Center for Neural Communication Technology, University of Michigan - The underlying goal for all of the work conducted by the CNCT is to make multichannel recording and stimulation devices available to researchers which will enable them to more efficiently communicate with the brain. Central Institute for the Deaf - A network of resources central to knowledge and the progressive treatment of adult and childhood deafness. Council for Accreditation in Occupational Hearing Conservation (CAOHC) - Professional accreditation organization. Deaf World Web - Comprehensive deaf-related resource. Deafsign - Information, contacts and discussion on issues related to deafness and sign language. Department of Communication Disorders, University of Wisconsin - Provides students with opportunities for study in the areas of speech-language pathology, audiology, and the normal aspects of speech, hearing, and language. ENT: Ear, Nose, Throat - American Academy of Otolaryngology site. Etymotic Research (ER) - Produces integrated circuits and other innovative products for the ear, including microphones, Musicians Earplugs, and instrumentation for real ear measurement, auditory brainstem response and otoacoustic emissions testing. ER maintains strong business partnerships with many of the key engineering firms in the hearing industry. H.E.A.R. (hearnet.com) - Hearing information for musicians and music lovers. HealthyHearing - ews, information and resources for those interested in hearing, causes and treatment of hearing loss, as well as hearing amplification systems. Hereditary Hearing Loss - Papers, databases, positions, meetings of interest to hereditary deafness researchers. Hearing Education and Awareness for Rockers (H.E.A.R./hearnet.com) - A non-profit organization dedicated to raising awareness of the real dangers of repeated exposure to excessive noise levels which can lead to permanent, and sometime debilitating, hearing loss and tinnitus. Hearing, Balance and Speech Center - Under the direction of Natan Bauman, Ed.D., a leading authority in the field of hearing health audiology, including hearing aid assessment and design, vestibular diagnosis and treatment and tinnitus and hyperacusis treatment. Hearing Loss Association of America (HLAA) - A leading organiztion in the U.S. representing people with hearing loss. HLAA provides assistance and resources for people with hearing loss and their families to learn how to adjust to living with hearing loss. It works to eradicate the stigma associated with hearing loss and raise public awareness about the need for prevention, treatment, and regular hearing screenings throughout life. Hearing Loss: Merck Manual Home Edition - Merck Manual entry on hearing loss. 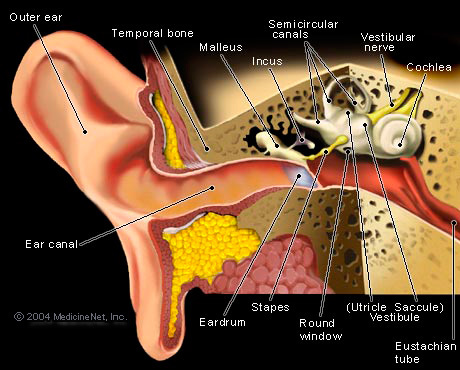 House Ear Institute (HEI) - Researching the auditory system from the ear canal through the inner ear and into the cortex of the brain. HEI has achieved an international reputation as a leader in its field through its applied otologic research and education programs. Institute of Noise Control Engineering of the U.S.A. (INCE/USA) - Promotes engineering solutions to environmental noise problems. International Society for Augmentative and Alternative Communication (ISAAC) - Works to improve the lives of children and adults who use AAC. ISAAC's vision is that AAC will be recognized, valued and used throughout the world. Kim Auditory Neuroscience Laboratory - Auditory neuroscience, computational neuroscience, hearing, neurophysiology, neuroanatomy, otolaryngology, audiology, modeling, otoacoustic emissions, presbycusis, aging. Kresge Hearing Research Institute (Ann Arbor, MI) - Investigating basic questions of hearing and of deafness. Learning Disabilities Association of America (LDA) - Believes that every person with learning disabilities can be successful at school, at work, in relationships, and in the community - given the right opportunities. LDA's mission is to create opportunities for success for all individuals affected by learning disabilities and to reduce the incidence of learning disabilities in future generations. Merck Manual Search - Search Merck Manuals for hearing loss, or tinnitus, vertigo, earache, deafness, Meniere's Disease, etc. Military Audiology Association - Advancing the profession of audiology within the US Department of Defense. Musicians' Clinics of Canada, Toronto, Ontario - Information on music related hearing loss. Director: Marshall Chasin, M.Sc., Reg. CASLPO, Aud(C). National Association of the Deaf (NAD) - NAD safeguards the accessibility and civil rights of 28 million deaf and hard of hearing Americans in a variety of areas including education, employment, health care and social services, and telecommunications. Topics covered include American Sign Language and Interpreting; Legal Rights; Deaf Culture and Community; Education and Employment; Parents, Family and Friends; and Technology. National Center on Deafness, California State Northridge - California State Northridge, one of the first mainstream universities to accept deaf students in the 1960s, now hosts one of the largest deaf student populations among U.S. universities. Nearly 300 deaf and hard-of-hearing students receive sign language interpreting, real-time captioning and other special services each year through the university's National Center on Deafness (NCOD). National Centre for Audiology - Houses Canada's largest educational and research programs in the field of hearing health care. National Hearing Conservation Association (NHCA) - Primary focus is related to hearing conservation with additional services in pulmonary function screenings, medical certifications for respirator use, EKG monitoring, etc. National Institute for Occupational Safety and Health (NIOSH) - Federal agency responsible for conducting research and making recommendations for the prevention of work-related disease and injury. Noise and Hearing Loss Prevention - NIOSH hearing loss prevention workplace and health information. National Institute on Deafness and Other Communication Discorders (NICD) - Conducts and supports biomedical and behavioral research and research training in the normal and disordered processes of hearing, balance, smell, taste, voice, speech, and language. Director: Robert A. Dobie, M.D., F.A.C.S. Dr. Dobie is the author of the author of Medical-Legal Evaluation of Hearing Loss, 2nd Edition. Noise Pollution Clearinghouse (NPC) - Extensive online noise-related resources. Also visit NPC's Hearing Loss and Occupational Noise Library. Occupational Safety & Health Administration (OSHA) - OSHA's mission is to ensure safe and healthful workplaces in America. OHSU Tinnitus Clinic - The OHSU Tinnitus Clinic, established by the Oregon Hearing Research Center at Oregon Health & Science University, was the first medical clinic devoted exclusively to the treatment of tinnitus. A model that others have followed, the Tinnitus Clinic helps patients from all around the world and also serves as a training facility for health care professionals. Oregon Hearing Research Center (OHRC) - Conducts basic and clinical research on the inner ear. Helps patients suffering from tinnitus. PubMed Search (National Library of Medicine) - Run a search "query" for hearing loss, or tinnitus, vertigo, earache, deafness, Meniere's Disease, etc. RIT National Technical Institute for the Deaf, New York - World's first and largest technological college for students who are deaf and hard of hearing. Self Help for Hard of Hearing People (SHHH) - Association representing consumers (26 million people) who are hard of hearing. Self-Help Groups for Speech, Language, and Swallowing Disorders - Provided by ASHA. Sight and Hearing Association - Dedicated to preventing the needless loss of vision and hearing through effective screening, education, and research. TDI - National advocacy organization focusing its energies and resources to address equal access issues in telecommunications and media for four constituencies in deafness and hearing loss, specifically people who are deaf, hard-of-hearing, late- deafened, or deaf-blind. United States Society for Augmentative and Alternative Communication (USSAAC) - Members join forces to improve the services, resources and products used by children and adults who turn to AAC methods in order to communicate. University of Maryland Medicine: Tinnitus & Hyperacusis Center - Dedicated to the evaluation and treatment of tinnitus and hyperacusis using a neurophysiologically based protocol known as Tinnitus Retraining Therapy (TRT). Vanderbilt Bill Wilkerson Center for Ontolaryngology and Communication Sciences - Patient services of the Vanderbilt Bill Wilkerson Center include audiology, speech-language pathology, comprehensive rehabilitation for acquired brain injury, and complete medical and surgical management of otolaryngologic and head and neck diseases and disorders. AudiologyOnline - Hearing aids, audiology resources, audiology jobs. Hearing Journal Directory - Global online resource for up-to-date contact information for the hearing industry. Comprehensive list of hearing health care manufacturers, distributors, service providers, and associations. Events calendar also provides a guide to the hearing industry's upcoming meetings and conferences. NIOSH Hearing Protector Device Compendium - Search engine that identifies protectors by type, manufacturer, features, desired Noise Reduction Ratings (NRR), or by inputting noise exposure levels in dBA or octave-band levels. Telecommunications device for the deaf - Wikipedia backgrounder. TTY Devices with Digital Wireless Phones - FCC guide. California Code of Regulations, Title 8 - Cal/OSHA Standards - Standards governing workplace safety. California Code of Regulations, Title 8, Section 3470. Longshoring Operations in the Vincinity of Repair and Maintenance Work - Section 3470 states "Longshoring operations shall not be carried on: When noise-producing maintenance, construction or repair work interferes with communication of warnings or instructions. California Code of Regulations, Title 8, Section 5095. General - (a) Scope and Application. Article 105 establishes requirements for controlling occupational exposures to noise. Agriculture, construction, and oil and gas well drilling and servicing operations are exempt from the provisions of Sections 5097 through 5100. Code of Federal Regulations - Hearing regulations available here and via Lexis and OHSA. Federal Registers: Occupational Injury and Illness Recording and Reporting Requirements (2001) [66:5916-6135] - Occupational Injury and Illness Recording and Reporting Requirements. Hearing Conservation Progam Regulations and Recommendations Summary [.pdf] - Comparison of HCP Regulations and the NIOSH Criteria Document by Deanna Meincke of Associates in Acoustics, Inc.
ISO Standards Handbook Acoustics - The full range of ISO International Standards developed in the field of acoustics. This two-volume collection of over 100 standards is the most comprehensive to date, covering general and specific methods for measuring noise from a wide range of sources and installations, as well as standards in the many different areas of acoustics: hearing threshold, audiometry, alarm signals, etc. OSHA: Occupational Noise Exposure - OSHA has developed this page to provide workers and employers with some information on occupational noise exposure. OSHA: Noise and Hearing Conservation - Information and technical links. Recognition, evaluation, control, compliance, devices, protection, directives, standards, technical specifications, measurement, training, and other resources. OSHA: OSHA 3077 1998 (Revised) - Informational booklet providing advice on earplugs and earmuffs personal protective equipment. OSHA: Recordkeeping - Information on the Agency's recordkeeping requirements. OSHA: Search Results - Search returns for "hearing loss" query at the OSHA site. OSHA : Technical Manual, TED 1-0.15A (1999, January 20) Technical Equipment, Section II: Chapter 3 - This is the section on Noise Monitors and Meters. Rights for Those with Hearing Loss - A list of legal and advocacy resources, as well as other services providing assistive technology and other accommodations for the deaf and hard of hearing by U.S. state. USCG Recommendations on Control of Excessive Noise (1982) [NVIC 12-82] - This Circular contains the Coast Guard's recommended guidelines to the U.S. maritime industry for addressing conditions of high noise. The guidelines were developed in consideration of the need for protecting crewmembers from noise exposures which may produce permanent noise induced hearing loss; for providing crewmembers with suitable conditions for recuperation from the effects of exposure to high noise levels; and for providing a safe working environment by giving consideration to the need for effective speech communication and for hearing audible alarms and warnings.